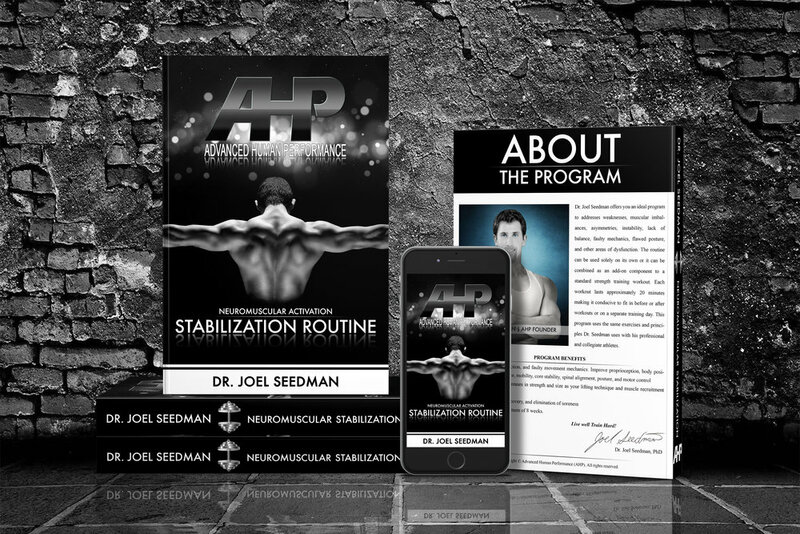 AHP presents Freak Athlete - an exclusive bundle package from Dr. Seedman that contains two of his most popular products for unlocking athletic performance and functional power. This is also an excellent product for in-season athletes looking to maximize recovery while maintaining top level conditioning. These products, when grouped together, present a transformative platform for gaining the ultimate athletic prowess, including unprecedented levels of speed and power, movement mechanics, neuromuscular stabilization, symmetry, mobility, postural alignment, and total body performance. Specifically, this Gold Tier bundle package contains (1) Speed & Power Program and (2) Neuromuscular Activation | Stabilization Routine. It's generally recommended that the athlete performs 2-3 workouts of each per week depending on which phase of the season they're in. See below for an overview of this bundle package and links to detailed descriptions of each included product. Speed and power-what every athlete wants, what every athlete needs, and what Dr. Seedman’s Speed & Power Program delivers. The tools and protocols used in this plan are taken directly from programs Dr. Seedman uses with his athletes to make them some of the fastest and most explosive athletes in their sport. Simply, if you're looking to get faster and improve your speed, explosiveness, power, agility, and overall quickness then this program is for you. This program to addresses weaknesses, muscular imbalances, asymmetries, instability, lack of balance, faulty mechanics, flawed posture, and other areas of dysfunction. Each workout lasts approximately ~20 minutes making it conducive to fit in before or after workouts or on a separate training day. This program uses the same exercises and principles Dr. Seedman uses with his professional and collegiate athletes to address muscular imbalances and stabilization issues. In addition, with your purchase of Freak Athlete, you receive 3 FREE awesome training routines by Dr. Seedman to ensure your entire body is completely transformed. Specifically, you'll receive the following: (1) Upper Body Blast, (2) Lower Body Blowout, and (3) Core Blitz. Each of these was specifically designed by Dr. Seedman to maximize strength, hypertrophy, and neuromuscular activation across the entire body. Upper Body Blast (Free Product #1) is an intense upper body template designed for targeting hypertrophy and strength in your chest, back, shoulders, and arms. The Lower Body Blowout (Free Product #2) is an elite lower body template designed for targeting hypertrophy and strength in quadriceps, glutes, hamstrings, calves, feet, and ankles. Finally, Core Blitz (Free Product #3) is the ultimate abdominal template designed for building core strength and definition.